Authors: J. Rameau, G. Chauvin, A.-M. Lagrange, A. Boccaletti, S. P. Quanz, M. Bonnefoy, et al. Figure 1 – Image of the newly discovered planet, HD 95086 b. The star has been blocked out by a coronagraph and the diffraction patterns removed during data reduction. The newly discovered planet, HD 95086 b, is the lowest mass exoplanet to be discovered using direct imaging, the exoplanet discovery technique that takes an image of the planet by blocking out the light from the central star. The planet surrounding the A-type star HD 95086 has a mass a few times larger than the mass of Jupiter. Direct detection of planets is one of of the more challenging, yet highly rewarding methods of exoplanet discovery. The challenges come from the high planet-to-star contrast and the small inner working angle. It’s like looking for a lightning bug while staring into a spot light. Most of the planets found using this method are located quite far from their central stars (> 100 AU) and often around solar to low mass stars that aren’t very bright. The imaged planets are also often very massive themselves, typically > 10 times the mass of Jupiter (MJup). Ground based imaging campaigns are getting better at detecting smaller, fainter planets closer to their stars. The technique use by Rameau et al. is called Angular Differential Imaging (ADI). ADI is a method of getting high contrast imaging with a small inner working angle. Even with state of the art coronagraphs and adaptive optics to correct for atmospheric effects, there is still so much diffracted and scattered starlight that blocks out any planetary signal. ADI takes advantage of the Earth’s rotation during the course of the night. The star field is allowed to rotate in the image plane, and many images are taken with different rotation angles. The planetary companion moves around in the field, but the diffraction patterns stay in the same place. The median diffraction pattern is subtracted from the individual images and what is left is just the planet. The individual images are then de-rotated and combined into the final image. This way the diffraction patterns closer to the star are removed and the small signal from the companion can be detected. 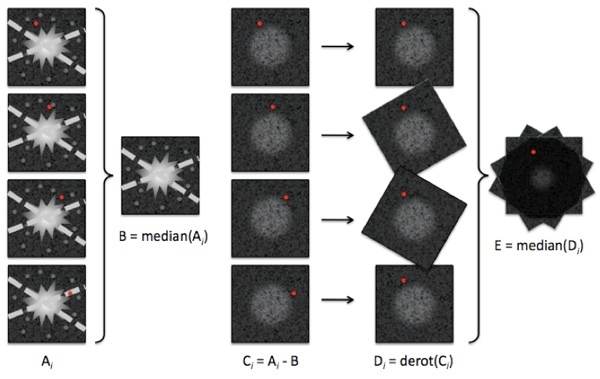 Figure 2 – Diagram explaining how the Angular Differential Imaging technique works. See the text for details. HD 95086 was observed as part of a larger program to survey young stars with known dust disks. Young stars are ideal for direct imaging because the newly formed planets are still radiating a lot of residual heat from their formation. This makes the glow brighter in the infrared where the star is not as bright. Therefore, astronomers do not need to achieve as high a contrast ratio to detect the planet. HD 95086 is a member of the Lower Centaurus Crux association of young stars, and has two different age estimates from two different methods – 10 Myrs and 17 Myrs. HD 95086 is at a distance of 90.4 pc and is known to harbor a bright, unresolved debris disk from previous far-IR and mm observations. The new images were taken with the Very Large Telescope (VLT) at L’ band (3.8 microns), and the data was processed using ADI. The planetary companion was found in two epochs of data. It is estimated to be a 4-5 MJup planet with a measured separation of 56.4 AU. 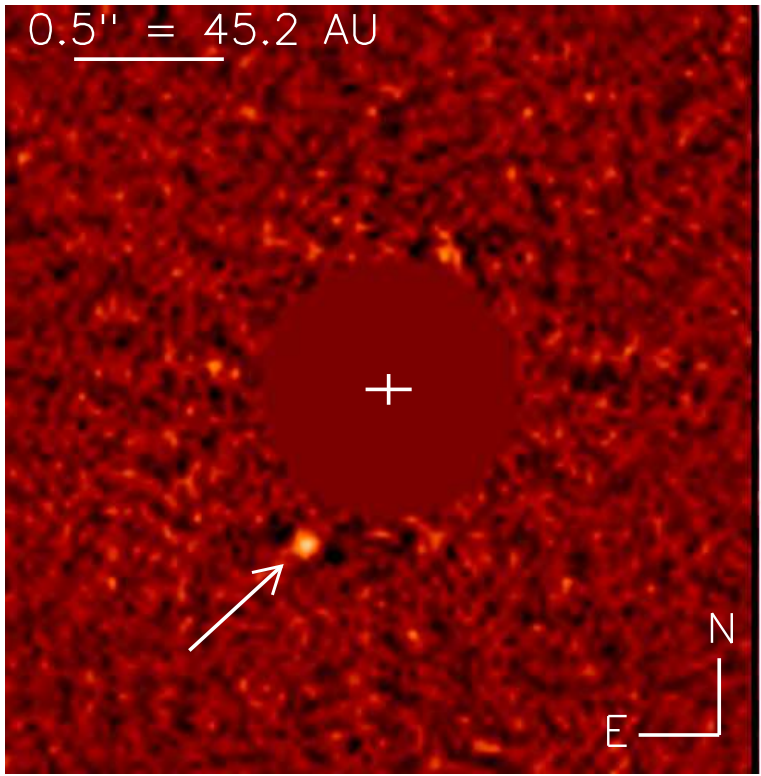 This is the lowest mass planet ever discovered using direct imaging. HD 95086 is located in a region of the sky that is very densely populated with stars. Therefore, Rameau et al. needed to be very careful about ruling out contamination from background stars. 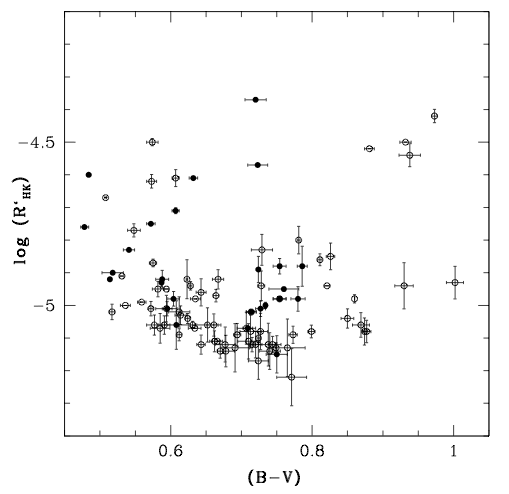 To determine if the companion candidate was indeed a companion and not a background star, Rameau et al. observed the system twice with more than a year between observations. The companion was confirmed to be co-moving. Another test to see if the companion candidate is a star or a planet is the object’s color. Since planets are much cooler than background M-stars, their peak brightness will occur at longer wavelengths, and the planets will appear redder. To test this, Rameau et al. also observed the system at a shorter wavelength (Ks-band, 2.18 microns). 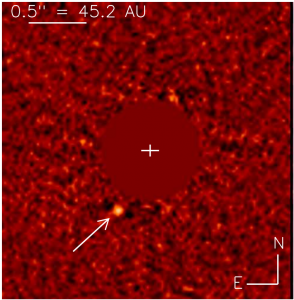 They did not detect the companion in the Ks-band images, making it unlikely that the object is a star. This, however, does not completely rule out the possibility of a coincident background brown dwarf. 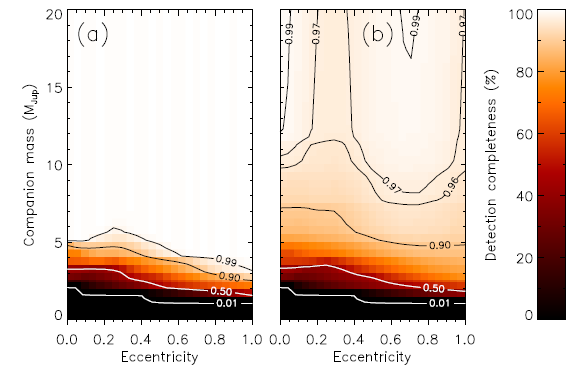 Using density numbers from brown dwarf surveys, Rameau et al. calculate the probability of the companion being a background brown dwarf is a low as 10-5. Figure 3 – Evolutionary models on a plot of color vs. magnitude. These models are used to determine the planet mass. The mass of the planet is determined by comparing evolutionary models to the color of the planet and the brightness of the planet and the star. Figure 3 shows this comparison on a plot of L’-Ks color vs. L’ magnitude. The exact color of the planet is unknown, but the non-detection in Ks-band defines the lower limit. The shaded region on the plot shows where the planet could be. 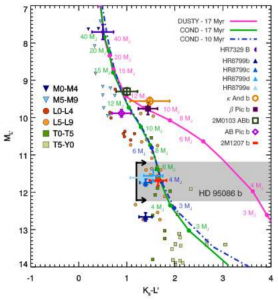 The different evolutionary models agree that the planet is ~ 4-5 MJup in mass. Even the uncertainty in the system’s age does not change the results by more than 1 MJup. Ground based imaging techniques are getting better at detecting smaller planets closer to their stars. But we are still a long ways away from being able to image planets similar to those in our own Solar System. For that, we will need to wait for the next generation of telescopes to be operated by the next generation of astronomers. The statement that planets that have been imaged are ” often around solar to low mass stars that aren’t very bright” is not really correct or is at least misleading. Of the 11 stars for which planets have been imaged, 5 are spectral type A or brighter, while 2 are brown dwarfs…..leaving only 4 “real” stars that are fainter than the sun that have planets that have been imaged. oops, sorry, I miscounted: it’s 6 out of 11 that are A or brighter as I somehow left out HD 65086 itself..